This section provides a list of free online photovoltaic softwares. Only for spain. DIAFEM is an online free application for designers, installers and anybody interested in renewable energy, for the design and calculation of electrification facilities no connected to the grid. Allows small wind turbines design facilities, photovoltaic and mixed to meet the energy needs of a demand. Global solar Atlas provides a summary of solar power potential and solar resources globally. It also provides an online free PV power simulation tool. The photovoltaic power production in this Atlas is simulated using multi-year, sub-hourly time series of solar radiation and air temperature. The PV production is based on the start-up phase of a PV project, so the long-term performance degradation of PV modules is not considered. Three main type of system can be selected from the Global Solar Atlas PV electricity calculation tab: small residential, medium-size commercial, and ground-mounted large scale. SISIFO is an online, free-software, simulator of PV systems developed by the IES-UPM in the frame of the European project PVCROPS. This version of SISIFO allows the simulation of different types of grid-connected PV systems, such as large grid-connected plants and building-integrated installations. SISIFO is free software: you can redistribute it and/or modify it under the terms of the GNU Affero General Public License version 3 (AGPLv3). It could give the global annual energy output of PV systems connected to the grid in USA or in many part of the world. For many locations it could also provides PV energy output hourly values. PV WATTS also provides international solar maps. Caution : it works only for crystalline solar panels. PVgis is the ideal free online tool to estimate the solar electricity production of a photovoltaic (PV) system. It gives the annual output power of solar photovoltaic panels. As a photovoltaic Geographical Information System it proposes a googlemap application that makes it easy to use. The area covered by the calculator is almost the world, America, Europe, Asia and Africa. PV*SOL online is a free tool for the quick and easy calculation of grid-connected photovoltaic systems (roof integrated/parallel or roof/ground mounted). 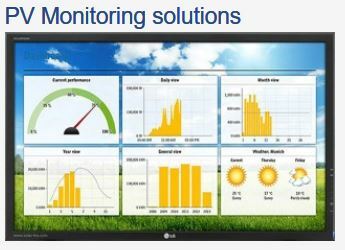 After inputting basic data for the location, load profile, annual energy consumption, module and inverter, the automatic configuration manager searches for the optimal module and inverter connections.